In another profession being put on light duty may mean that you don’t have to work as hard as everyone else. When an electrician is put on light duty it means something else entirely. I think I calculated the number of lights and it was well over 10,000 light bulbs in the coal-fired power plant in North Central Oklahoma. Ideally you would think that every one of the lights should be in good working order. Electricians don’t call a light bulb a light. The light is the fixture. The bulb is called a “lamp”. So, for the rest of this post I’ll call the light bulbs “lamps”. You may think that it’s pretty straight forward to go change out lights (oh. I mean… lamps), but it’s not. You see, it isn’t like in your house where you have the regular light bulbs everywhere with just different shapes and wattage. Sure, there were different Watts for the different lamps, but for a good number of the lights, they varied by voltage as well. Not only that, but these lamps were different types of lights. Most of which are not incandescent (well… now that the government has seen fit to force the lighting industry to stop making incandescent lamps altogether, I guess it wouldn’t seem odd to the younger folks). In the office areas and places like the main switchgear 4 foot fluorescent lamps were used. Each 4 foot fluorescent lamp is 40 watts. Just because it is 40 watts, it doesn’t mean that the voltage is low. 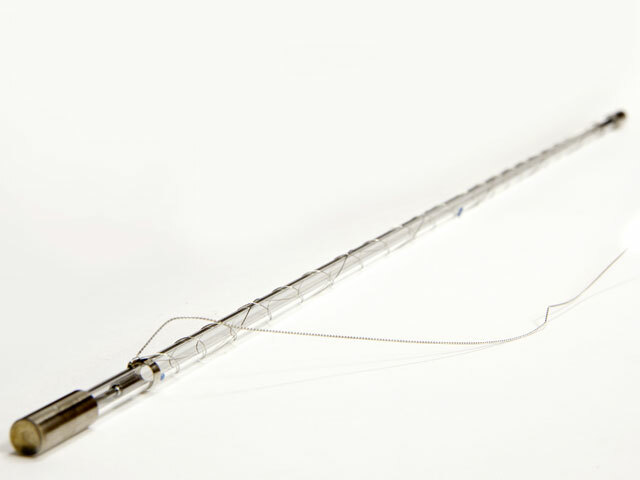 It can take up to 650 volts to start up a fluorescent lamp. 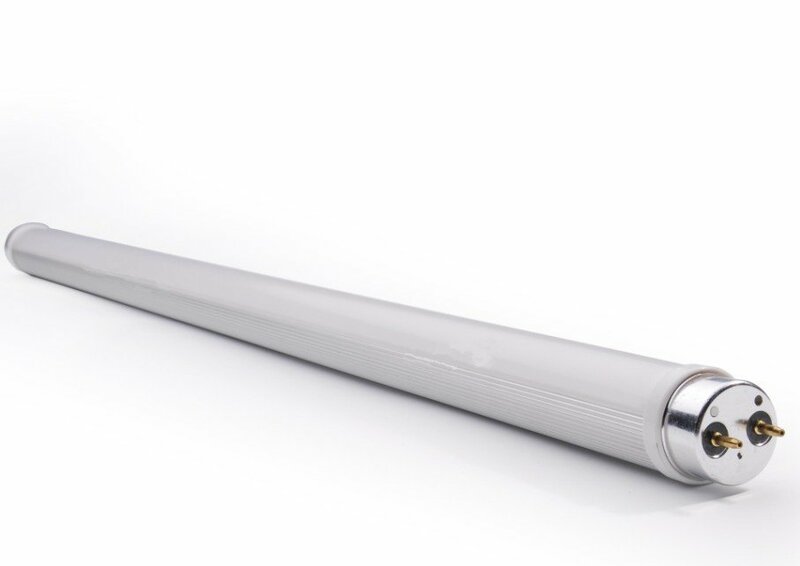 A Fluorescent lamp actually has a gas in it that causes a coating on the glass to glow when a current flows across the gas. Besides the typical fluorescent lamps, the majority of the rest of the lamps in the plant were various sizes of Mercury Vapor lamps. (now replaced with Sodium Vapor). 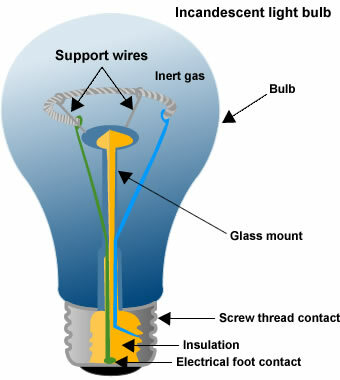 Before you become all twisted about using Mercury Vapor to light up a power plant because of the environmental impact, I think I should point out that even though a fluorescent lamp is filled with an inert gas like argon, it is mixed with Mercury vapor as well, and the phosphorous coating on the glass has mercury in it also. So, if you have fluorescent lamps in your house…. Well, there you go. And you know those lamps that are used to replace your old incandescent light bulbs….. Yep… and they have other kinds of hazardous metals as well. I suppose it is good for the environment to take those hazardous materials out of the earth and put them in lamps in your houses. Isn’t that improving the environment? The thing about using Fluorescent lamps and Mercury Vapors and Sodium Vapor lamps is that they all use different voltages. So, in order for them to start up and stay running, the voltages have to change from the start up voltage to the operating voltage. Each lamp has it’s own transformer designed just for that one type of lamp. 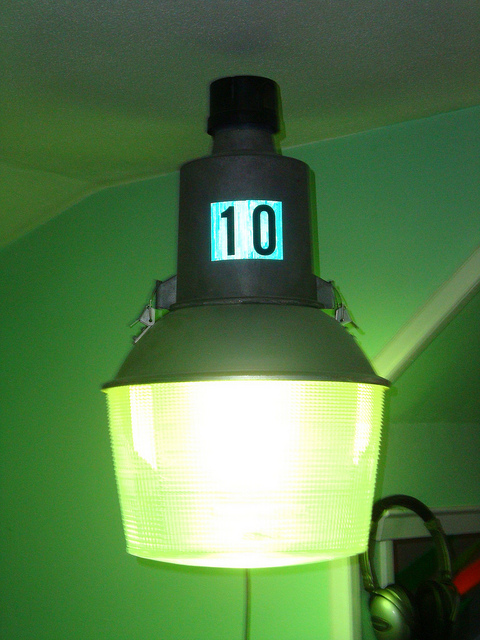 It is placed in the light fixture for the lamp. If the light glows blue, then it is mercury vapor. If it is orange then it is a sodium light. Your street lights are the same way. Well. 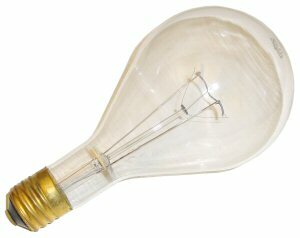 Now there is also Halogen lamps which shine white. Besides these different type lamps, we also had some super special lights. We have the flashing lights on the smoke stack and the red blinking light on the top of the radio tower. The lights that flash on the smoke stacks are really flashbulbs. 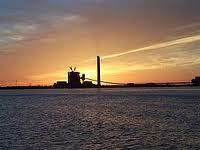 Our smoke stacks are 500 feet tall with beacons at the 250 foot level and the 500 foot level. Not only did you have to change out the bulb, but you often had to change out the large capacitors and the circuit boards that had been fried by a passing lightning storm. You may have heard that with the older style Television sets that had a picture tube (before the flat screen TVs came around), that you could electrocute yourself by taking the cover off the back of the TV and working on it, even though you unplugged the set from the wall before you started. A few movies used this in the plot. 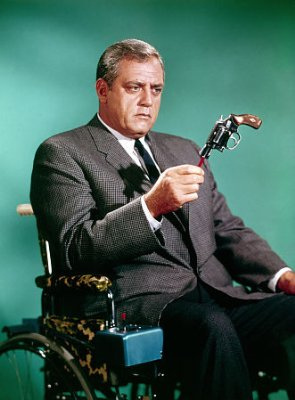 Robert T. Ironside even used it once in an episode during the first season. Well. The Stack lights are like that. When we opened up the light fixture to work on the flash tube or the circuits inside the first thing you did was take a metal rod with a wooden handle and a wire attached with a clip on the end and clipped the wire to the handrail. Then turning your head the other way, you placed the metal rod across each of the large capacitors in the box. Invariably, one of the capacitors would let out a loud pop that would echo across the lake…. oh, and leave your ears ringing. Once the voltage was discharged from all the capacitors, you knew it was safe to go to work fixing the light. The lights had a day and a night mode, and the difference was how many times the flash tube flashed when it discharged. What I mean to say is that it wasn’t just one flash. It is really a series of flashes closely timed to look like one flash. The number of flashes and the timing between the flashes determine how bright the flash is. At night the flash was much dimmer because it didn’t need to be so bright. When it was stuck in the day mode at night the farmers for a 30 mile radius would be calling saying they can’t sleep because every 6 seconds their bedroom would light up as the smoke stack lights would blink. I thought I would just put that picture in there so you could see how pretty the plant looked from across the lake at sunset. To me it looked like a big ship on the horizon. Yeah, looks just like something in your house. Doesn’t it? Our tower was like this only it didn’t have a safety pole up the side for a lanyard. I had to climb to the top of this tower to replace the red flashing light. I was by myself when I did it. Bill Bennett handed me the bulb that had been specially ordered and asked me if I would do it. If not, they could call Oklahoma City and have the line crew come down and change it. I told him I could do it. The tower wasn’t that tall, and I had shimmied around the top of the smoke stack before at 500 feet with only a slight urge to panic. 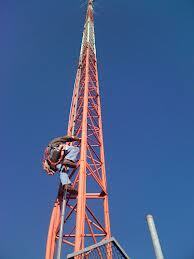 if your browser doesn’t play the video from the picture try this link: “Climbing a 1768 foot tower“. Ok. That is crazy! Wouldn’t dropping someone from a helicopter onto the tower using a safety line be safer? While we were there after they found out that we were electric conduit running fools, they gave us all sorts of jobs running conduit all over the plant. One job they showed us was in an area that was dark. All the lights were out in this area. The foreman explained where the light bulbs were kept. They were just the regular incandescent lights like the normal lights you would have in your house. Well… Ted and I had both been put on Light Duty at our plant, and we knew that when we went to change out one light, we were supposed to change out all the lights that were out. So, Ted and I each grabbed a box and a ladder and headed up to the boiler enclosure to change lights. After lunch, the foreman came running up to us yelling, “What did you do? You used up all of the light bulbs!” Well. Yes. We had used up the lights, but now when you go up on the boiler you can see where you are going. The foreman then explained to us that this little plant didn’t have the same kind of budget that the new big plants had. They couldn’t afford to just go around replacing all the lights whenever they burned out. They only put in a light when someone has to work in that area. We had lit the entire place up like a Christmas tree. Ok. Take a note Jan… Don’t replace all the lights if they are incandescent. Ok (again), that wasn’t quite the last story. Let me tell you some more about replacing Fluorescent lamps in our Coal-fired power plant. When we were placed on Light Duty, we would grab a couple of boxes of 30 lamps from the pallet in the main switchgear and go to work. 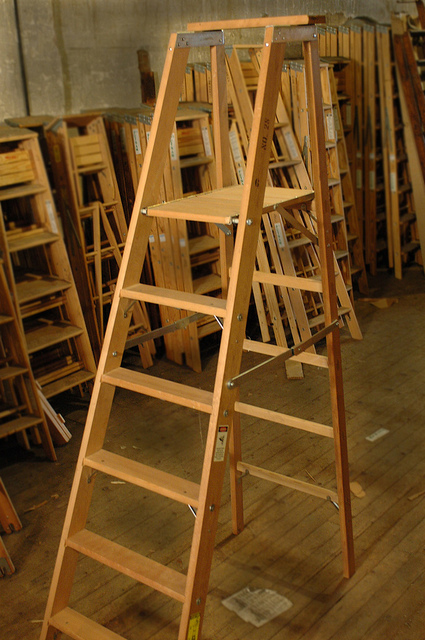 I didn’t like using this wobbly ladder when I was by myself. besides being wobbly, the thing weighed a ton. So, I would take a smaller ladder and put it on top of the breaker cabinets and climb on top of them. The only problem here was that I couldn’t get directly under the lights, so I would end up reaching out to one side to change a light while I was standing on a ladder on top of a seven foot cabinet. Not a pretty sight if someone safety minded walked in. I felt safer doing this than standing way up in the air on a 10 foot wobbly platform ladder. I always had the feeling that if I sneezed, the ladder would topple over. The rule of thumb was to keep your belt buckle within the rungs on the ladder. When we were done changing out fluorescent lamps, we usually had a stack of boxes of burned out lamps. We couldn’t just throw them in the dumpster because they were a safety hazard as they were. We had to break each bulb. We found that we could take a box of 4 foot fluorescent lamps and back the truck over it and it would let out a low but loud boom that sounded like a cannon going off. The ingenious electricians invented a bulb busting barrel where you slid one 4 foot bulb into a tube and then lifted a handle quickly, and it would explode the lamp in the safe confines of the metal barrel. The end of the lamp may at times come shooting out the end of the tube, so you never wanted to be standing to that side of the barrel. I would show you a picture of one, but I’ve never found another one like it. So, if you were into breaking glass, this was the best part of being placed on Light Duty. After a hard day of changing out lamps all over the plant, you could stand around in front of the electric shop and slide the lamps down a tube like mortar shell and pull the rod and…. Boom! A puff of Mercury Vapor released into the atmosphere a small cloud of dust…. repeat. I remember being on “Light Duty” at the Mustang Power Plant as a summer student in 1967. We changed the 1000 watt bulbs in the top of the turbine room. It was so hot, we had to wear gloves.